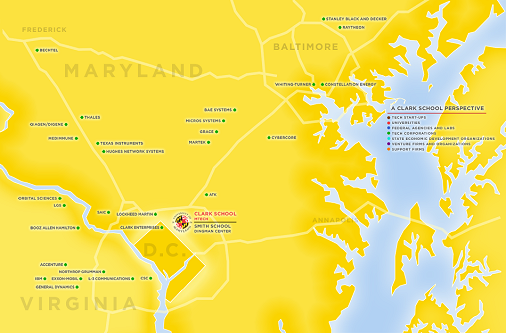 Located just a few miles from Washington, D.C., the Clark School is at the center of a constellation of high-tech companies and federal laboratories, offering students and faculty access to unique professional advancement opportunities with industry and government partners. Every day our students get hands-on experience that they will take into the world. Darryll J. Pines has served as Dean since January 2009. Dr. Pines has led the Clark School's efforts in raising student retention, achieving success in international student competitions, placing new emphasis on sustainability engineering and service learning, promoting STEM education among high school students, increasing the impact of research programs, and expanding philanthropic contributions to the school. Pines received a B.S. in mechanical engineering from the University of California, Berkeley. He earned M.S. and Ph.D. degrees in mechanical engineering from the Massachusetts Institute of Technology. Learn more about Dean Pines. Aerospace Engineering: 100 B.S., 45 M.S., 15 Ph.D.
Bioengineering: 104 B.S., 7 Ph.D.
Chemical Engineering: 78 B.S., 3 M.S., 7 Ph.D.
Civil Engineering: 134 B.S., 45 M.S., 20 Ph.D.
Fire Protection Engineering: 29 B.S., 10 M.S. Materials Science and Engineering: 37 B.S., 3 M.S., 10 Ph.D. Mechanical Engineering: 350 B.S., 50 M.S., 45 Ph.D. The Clark School's nearly 200 faculty members are nationally recognized and highly respected in their fields. More than 100 faculty members are fellows of engineering professional societies, and more than 50 are recipients of National Science Foundation Early Career Awards. The Clark School has 22 affiliated faculty who are members of the National Academy of Engineering. The Center for Minorities in Science and Engineering (CMSE) and Women in Engineering (WIE) offer many programs, including mentoring, research internships, and summer programs, all of which are designed to aid in maintaining diversity goals. Supporting the efforts of CMSE and WIE, and providing valuable assistance to the Clark School, are three student societies—the Black Engineers Society, the Society of Hispanic Engineers, and the Society of Women Engineers. Learn more about diversity at the Clark School. The campus has launched its $1.5 billion campaign Fearless Ideas: The Campaign for Maryland. The fundraising campaign — our most ambitious to-date — will focus on elevating and expanding our mission of service, enhancing our academic distinction, and bolstering a leading-edge research enterprise that has the power to improve the lives of millions. Support for students, which can come in the form of undergraduate scholarships and graduate fellowships or donations for student teams and activities. A special opportunity is the Clark Challenge for the Maryland Promise which matches dollar-for-dollar new contributions for need-based undergraduate scholarships. The E.A. Fernandez IDEA Factory will be a space for the greatest minds of our time to work together to create engineering breakthroughs and solve the grand challenges of the 21st century. The IDEA Factory will be home to the student-run incubator Startup Shell and a co-working space for student competition teams. Endowed chairs, professorships, and fellowships help advance research productivity and recognize excellent teaching. These positions help recruit and retain the best educators. The Clark School provides undergraduates access to early hands-on learning experiences through a variety of programs and offerings. The Keystone Program encourages the school's best faculty members to teach fundamental freshman and sophomore courses. Faculty members are selected from throughout the school and are assisted by additional support personnel. Courses are closely reviewed to achieve academic excellence and high student interest in courses. Keystone brings beginning engineers an enhanced educational experience, reinforces and recognizes outstanding teaching, and serves a national model for increasing engineering student retention and graduation rates. Clark School of Engineering leadership opportunities, including workshops, campus organizations, and coursework are designed to promote student leadership development and enhance the skills employers are looking for most. There are so many programs to choose from. Learn about them here. With over 60 international engineering programs available, the possibilities are endless. The Office of International and Leadership Programs at the Clark School works with students throughout the process to ensure they find a program that is a good fit. Engineering programs exist in Europe, South America, Australia, New Zealand, Asia, and the Middle East. The ENES 100 is a project-based course that requires all first-year students to work in teams to develop a complex and multidisciplinary product. Students must apply engineering principles, computer software tools, and technical communication skills to meet all of the product performance and project reporting requirements to build a hovercraft. Student teams compete against one another to determine which team could most successfully navigate a course with their hovercraft creation. Learn more. Nothing spurs creativity and innovation more than a combination of incentive and challenge: a reward for achievement, combined with the urgency of a dare to succeed and the reality that we must race against others. We are at our best when we compete. This is why prizes and competitions are crucial to create a climate of innovation and entrepreneurship and to drive new advances in targeted areas. At the Clark School, competing for external prizes has had an enormously positive effect on student development. Our cutting edge, interdisciplinary research initiatives are focused on the most challenging and critical issues of our time. In approaching complex problems, UMD faculty members immerse themselves in creativity and innovation, moving research ideas from the bench top to the market. Our capabilities for Mpact are broad. We are leading research advancements in energy and sustainability, aerospace, bioengineering, robotics, biomedical devices, nanotechnology, fire protection, and disaster resilience. These capabilities can help transform lives not only nationally but internationally. The world's population is now over 7 billion people. In the next two decades, almost 2 billion more people will inhabit the Earth. It has been estimated that 95 percent of that growth will take place in developing or underdeveloped countries. Engineers have a role and responsibility in helping to solve global problems. In addition to faculty research and innovation, our students are engaged in international outreach through programs like Engineers Without Borders and Maryland Sustainability Engineering. These groups are committed to sustainable development across the region and abroad, visiting places like Peru, Sierra Leone, and Ethiopia to improve communities through engineering projects, including powering schools sustainably, making drinking water safe, and creating new community centers. The Clark School is leading research advancements in aerospace, bioengineering, robotics, nanotechnology, disaster resilience, energy and sustainability, and cybersecurity. From the universal product code to satellite radio to SMS text messaging to the implantable insulin pump, our students, faculty, and alumni are engineering life-changing innovations for millions. Learn more about our research centers and institutes. A state of the art facility used in aerodynamic research and development. Dedicated to the development and scale-up of biotechnology products and processes. Learn more about our research facilities. The University of Maryland’s location inside the capitol beltway provides unique professional opportunities to students. The Clark School’s Engineering Co-op & Career Services Office provides a full range of career development programs and services to students and employers interested in cooperative education, internships, and post-graduation engineering positions. Canon U.S. Life Sciences, Inc., a subsidiary of Canon U.S.A., Inc., and the Clark School continue a research collaboration to develop a highly automated system providing rapid infectious disease test results while also simplifying the process to allow clinical staff to perform point of care disease diagnosis. Leidos, a national security, health, and engineering solutions company, invests in UMD’s leading engineering, public health, and cybersecurity research and education programs. Donations support programs that promote diversity in STEM, talent development programs, research efforts, student activities, scholarships, and fellowships. The University of Maryland and Northrop Grumman collaborate to develop the Advanced Cybersecurity Experience for Students (ACES), the nation’s first cybersecurity honors program for undergraduates. Sikorsky Aircraft Corp., a Lockheed Martin Company, commits $1 million dollars to endow a fund creating the Igor Sikorsky Distinguished Professorship in Rotorcraft at UMD’s Clark School. Whiting-Turner supports efforts to equip Department of Civil and Environmental Engineering students with the resources needed to develop comprehensive understanding of the engineering science behind the systems and structures on which society relies. The donation will help bring to life the department’s vision for new, state-of-the-art facilities and laboratory equipment. Visit our Corporate Partners page to learn more. The Maryland Technology Enterprise Institute (Mtech) has a three-part mission to educate the next generation of technology entrepreneurs, create successful technology ventures, and connect Maryland companies with university resources to help them succeed. Mtech has had a $25.7 billion impact on the Maryland economy since 1983. Top-selling products such as MedImmune’s Synagis®, which protects infants from a deadly respiratory disease, and Hughes Communications’ HughesNet®, which brings satellite-based, high-speed Internet access to the world, were developed through or enhanced by Mtech programs. Billion-dollar companies such as Martek Biosciences and Digene Corporation graduated from Mtech’s incubator programs. Visit Entrepreneurship & Innovation to learn about all of our programs. In the Princeton Review's "Top 50 Schools For Entrepreneurship Programs," published in Entrepreneur magazine, the University of Maryland ranks 8th for its undergraduate program and 25th for its graduate program. DC I-Corps is a regional program designed to foster, grow and nurture an innovation ecosystem in the nation’s capital, the nearby states of Maryland and Virginia, and the mid-Atlantic region. The program is sponsored by the National Science Foundation and jointly run by the University of Maryland, George Washington University, and Virginia Tech. Startup Shell is a new student-run technology collective that advances student ventures while leading educational initiatives in the greater campus community. It provides work space resources and business direction through a vibrant, collaborative environment. Glenn L. Martin, benefactor and pioneer airplane builder. A. James Clark, '50, benefactor and Chairman and CEO, Clark Enterprises, Inc.
Jeong H. Kim, '91, benefactor, founder of Yurie Systems and former president of Bell Labs. Robert E. Fischell, benefactor and inventor of medical devices, including the flexible coronary artery stent. Brian Hinman, '82, benefactor, co-founder of Polycom and educational innovator. Harry B. Smith ‘49, inventor of the pulse Doppler radar. George Laurer ’51, creator of the universal product code. Robert Briskman, '61, co-founder of Sirius Satellite Radio. Brendan Iribe, former student, co-founder and CEO of Oculus VR, purchased by Facebook for $2B. The University of Maryland Alumni Association supports the university in its pursuits of excellence in teaching, research, and public service and seeks to foster a spirit of loyalty, involvement, and life-long commitment to the university in its alumni. Learn more at alumni.umd.edu. The University of Maryland Clark School of Engineering Alumni Chapter supports the welfare and advancement of the university and school through the promotion of educational, social, alumni-focused, and student-focused activities. The Alumni Cup is an annual engineering design competition launched in 2012 by the University of Maryland Alumni Association Engineering Network. Teams of students from each department compete against one another in a week-long challenge to develop a machine that will perform a specific task within certain parameters. The task and parameters are given to each team on the Friday before Engineers Week in February. Students have one week and a small stipend with which to design, sketch, and build the best machine within their ability that reflects their department. Teams demonstrate their designs in the Jeong H. Kim Engineering Building Rotunda. The judges’ panel is comprised of five individuals from both the Clark School administration and the Alumni Association. The winning team is memorialized on the Alumni Cup trophy displayed in the west lobby of the Glenn L. Martin Hall. One way to have fun and find out if engineering might be a good fit is to try one of the summer programs offered by the Clark School. 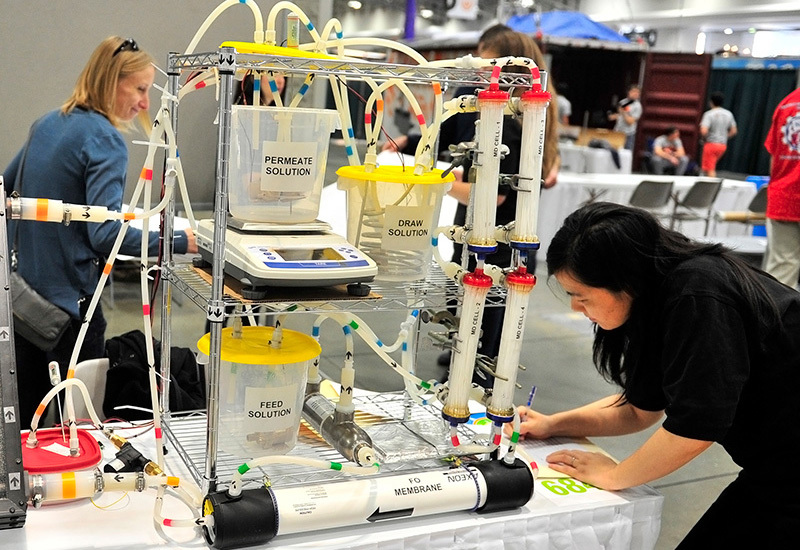 Participants learn about engineering, participate in hands-on activities, and meet engineering students and professors. The Clark School also offers workshops that give youth a chance to explore engineering during a one-day activity. iEngineer at the University of Maryland is a summer STEM camp. This one-week commuter camp is an exciting opportunity for girls and boys to learn through a variety of fun, hands-on activities. CyberSTEM camp is a one-week commuter summer program at the University of Maryland, College Park for middle school girls who are interested in the growing field of cybersecurity. Stepping Stones to Your Future is an annual summer engineering commuter camp. It is an excellent opportunity for young men and women who are interested in science and engineering to work with current UMD students on a variety of fun and hands-on engineering activities. The Intermediate CyberSTEM camp is a one-week commuter summer program at the University of Maryland (UMD) for high school girls who are interested in the growing field of cybersecurity. Cyber Defense Training Camp is an intermediate level seven-day residential summer program for rising juniors and seniors in high school. The Discovering Engineering program is an engineering summer camp for for rising juniors and seniors in high school. ESTEEM/SER-Quest is a four-week summer program with lab demonstrations, lab tours, lab experiments, and a SAT Workshop. Students who participate in the program will have the opportunity to have research project with an engineering faculty member. Exploring Engineering at UMD is a summer program for rising juniors or seniors who are considering engineering as a possible major and career. S.A.T. Strategies is a workshop focused on successful test-taking skills and reasoning strategies to help students maximize their scores on the SAT. S.P.I.C.E. Camp is a commuter program for young women who would like to learn more about engineering. The Women in Engineering Leadership Enhancement, Application and Design Academies provide high school students with the opportunity to spend a day learning and applying principles related to a particular engineering discipline offered at UMD.